Now with advanced OpenAPI 3.0.2 validation, code generation & multi-file support! Swagger‑OpenAPI design, documentation & development power, right in your Eclipse IDE! RepreZen API Studio is the most productive REST API design environment, with everything you need to design, document and deliver world-class APIs and microservices in a fraction of the time. "Best Swagger/OpenAPI editor out there... RepreZen makes it so easy to get your OpenAPI definition just right without wrestling with the fiddly little details of YAML syntax. I wasted more days than I care to admit on stuff that RepreZen just 'handles'. Try lots of products. Give all the programming editors a shot. You'll learn quickly that this is the best solution for creating OpenAPI definitions. Or you could just save yourself the pain." Model your APIs with industry-standard Swagger–OpenAPI 2.0, OpenAPI 3.0.2 or with RAPID-‑ML, an innovative, domain-driven API modeling language. Full support for OpenAPI 3.0 editing, based on the current 3.0.1 specification, with live views and code generators for Documentation, Diagram and Swagger UI v3. Here's how you can get started with OpenAPI v3. Full-featured Editors for all supported languages, with code assist, customizable code templates, detailed validation messages, outline view, customizable fonts & syntax color themes. Live documentation and diagram views give you immediate insight to your API design, as you edit. You can also generate and publish these as documentation for your API client developers. Easily supports large multi-file projects. Share and standardize schema definitions and API components across projects. Split large and complex Swagger Specifications across multiple files for easier navigation and team collaboration. 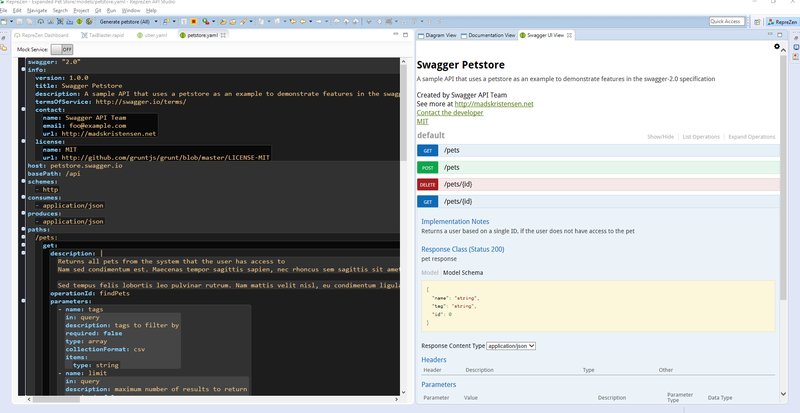 Built-in sandbox testing with the integrated mock service and Swagger UI view. Powerful, extensible code gen framework lets you build custom generators with powerful Xtend templates and integrated debugging. Also fully supports Swagger Codegen, OpenAPI Generator, and NSwag open source generators. Over 200 generators ready to use, including server implementation scaffolds, client libraries, documentation and more. Maven and Gradle build automation for code generation, and a convenient YAML configuration format for each generation target that provides access code gen options. Standard and custom generators all use this project structure to run inside API Studio, from the command line, or from continuous integration. Example projects help you get started quickly and come up to speed with the features of RAPID-ML, Swagger‑OpenAPI 2.0 and OpenAPI 3.0. Runs on Eclipse as a standalone RCP app, or as a plug-in feature in a standard Eclipse IDE. You can do your work in your primary development space, with full access to all of your resources, not stuck in a browser sandbox. Plug-in team collaboration with Eclipse integrations. API Studio supports a wide range of version control, issue trackers, and continuous integration tools. Git and GitHub are fully supported. Collaboration works on the platforms you're already using, so you don't have to manage a separate set of teams and permissions. Your APIs. Your code. No limits. RepreZen doesn't hold your API designs hostage, and won't put any limits on the number of APIs or resources you create. So go ahead and redesign your world as microservices. Edit, test, generate, collaborate, publish, deploy... and become the stuff of API legend. This Marketplace item installs API Studio for Eclipse, the add-on solution for standard Eclipse IDE distributions. API Studio Desktop, a standalone RCP application, is available here. By adding the following code below to your website you will be able to add an install button for RepreZen API Studio. Unable to read repository at products.reprezen.com/reprezen/updates/current-release/content.xml. anyone have a fix for this issue ? Sorry that you encountered this issue! We have only had one customer reporting this problem, and only on "Check for Updates," never on initial installation. There seems to be an issue with the certificate trust chain in certain environments. In Preferences > Install/Update > Available Software Sites, remove any RepreZen update sites that have already been configured. You can name it "RepreZen API Studio Current Release". Please note that the URL uses HTTP, not HTTPS. Go to Help > Install New Software..., and select the update site you just added. Check both "RepreZen API Studio" and "RepreZen API Studio Dependencies", and click through to complete the installation. If this doesn't work for you, please open a support ticket at http://support.reprezen.com, and we'll be happy to help troubleshoot this.